Translators first find equivalent English ways of expressing the meaning of the original text. This procedure ensures that the translation is faithful to the meaning intended by the original text. The next consideration is readability – the meaning as expressed in natural American English using common punctuation, capitalization, grammar, and word choice. The third consideration is selection of the natural equivalent that most closely reflects the style of the Hebrew, Aramaic, or Greek text. This translation method is designed to avoid the awkwardness and inaccuracy associated with form-equivalent translation, and it avoids the loss of meaning and oversimplification sometimes found in function-equivalent or paraphrase translations. Layout In published form and in PC Study Bible, God's Word Translation looks like other works of literature. It contains frequent paragraphing. Whenever a different speaker's words are quoted, a new paragraph begins. Lists, genealogies, and long prayers are formatted to help readers recognize the thought pattern of the text. 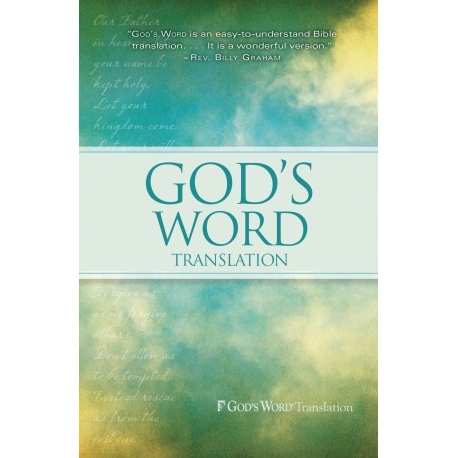 The prose style of God's Word Translation favors concise, clear sentences and avoids very long, complicated sentences. Punctuation, Capitalization In English, meaning is conveyed not only by words but also by punctuation. However, no punctuation existed in ancient Hebrew and Greek writing, and words were used where English grammar would prefer punctuation marks. God's Word Translation uses standard English punctuation wherever possible. At times this means that a punctuation mark or paragraph break represents the meaning that could only be expressed in words in Hebrew or Greek. Gender References The Scriptures contain many passages that apply to all people. God's Word Translation strives to use gender-neutral language in these passages so that all readers will apply these passages to themselves. For example, traditionally, Psalm 1:1 has been translated, "Blessed is the man who does not follow the advice of the wicked . . . ." As a result, many readers will understand this verse to mean that only adult males, not women or children, can receive a blessing. However, in God's Word Translation , the first Psalm begins "Blessed is the person who does not follow the advice of the wicked . . . ."
However, if a passage focuses upon an individual, God's Word Translation does not use plural nouns and pronouns to avoid the gender-specific pronouns he, him, and his. In these cases the translators considered the text's focus upon an individual more important than an artificial use of plural pronouns. In addition, gender-specific language is preserved in passages that apply specifically to men or to women. Word Choice Many Bible translations contain theological terms that have little, if any, meaning for most non-theologically trained readers. God's Word Translation avoids using these terms and provides substitute words that carry the same meaning in common English. In some cases traditional theological words are contained in footnotes the first time they occur in a chapter. Examples of these theological terms include covenant, grace, justify, repent, and righteousness. All of these features make God's Word Translation a uniquely readable and understandable Bible making the words of Christ – as revealed through his prophets and his apostles – come to life for you.